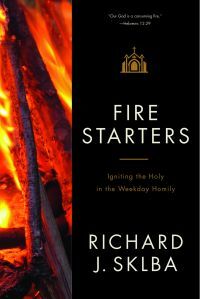 MILWAUKEE (CNS) — For Bishop Richard J. Sklba, “Fire Starters” is a compilation of the study, prayer, reflection and pastoral creativity that have been part of his more than 54 years of priesthood. Thus, it is fitting that a volume devoted to the homily at daily Mass includes a declaration that the author preaches and practices. “I’ve been praying about the readings, as a personal practice, for decades. As the years go by, I continue to see more and more in those readings — the more applications, the more people I deal with, the more pastoral implications I am exposed to, the more I see the Word continues to have an application,” said Milwaukee’s retired auxiliary bishop. Since moving to Old St. Mary’s Church, Milwaukee, seven and a half years ago, Bishop Sklba has celebrated the parish’s 7 a.m. Mass on Mondays and Wednesdays when he is in town. While Bishop Sklba was officially retired, he wanted to remain of service as Milwaukee Archbishop Jerome E. Listecki continued his transition into the job as head of the archdiocese, and as the archdiocese filed for bankruptcy. Eventually, the bishop established a regimen that included three hours of writing each morning, and nearly another three every afternoon. “I’ve gradually become more conscious of the diversity of that group,” he told the Catholic Herald, a publication serving the Catholic community in southeastern Wisconsin.